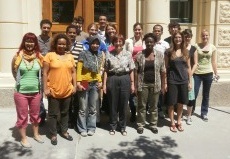 The following students participated in the course Methods of Knowledge Integration in Inter- and Trans-disciplinary Research at the Universität für Bodenkultur Wien (University of Natural Resources and Life Sciences Vienna) in June 2012. The course was run as part of the dokNE (Doctoral School Sustainable Development) and was also open to other students. I am analysing the management of production forests on Java Island, especially after enactment of Indonesia’s decentralization policy. My focus is a case of Kendal District, Central Java Province and I will examine changes of role, power, and authority of various state and non-state actors. I am at the Institute of Forest, Environmental and Natural Resource Policy (INFER). After graduating in 2011 I joined the Doctoral School Sustainable Development (dokNE) to study “Perception and assessment of ecosystem services on river landscapes”. This project aims to develop an assessment method that draws a link between rivers subjected to different uses, the provision of ecosystem services and different stakeholder attitudes. The project extends my masters studies, where I focused on water management and aquatic ecology, with a thesis on the recreational use of river landscapes. Project: Perception and assessment of ecosystem services on river landscapes. I am contributing to the empowerment of rural mountainous communities by connecting them to local and global knowledge in order to find innovative ways to improve their livelihoods while preserving cultural and natural diversity. My current geographic focus is European mountainous areas, but eventually I hope to expand to South America and other continents. My professional background involves supporting regional cooperation and environmental peacemaking; facilitation of professional training in sustainability; education for sustainable development; and sustainable development of mountainous areas. In addition to undertaking my PhD research, I am a consultant for the Zoi environment network and for UNEP Vienna – Interim Secretariat of the Carpathian Convention. Project: Knowledge integration and learning as factors in sustainable development of the rural mountainous areas: Transferability to the Carpathians and the Northern Caucasus. Water is important to our lives. I am conducting research about factors leading to lack of access to safe water in rural Uganda with the aim of promoting collective action among water users. More details. Project: Governance for equitable and sustainable access to safe water in rural Uganda. After graduating from the University of Natural Resources and Life Sciences (BOKU) in Vienna, I joined the Doctoral School of Sustainable Development (dokNE) in October 2011, also at BOKU. In my project I will develop, implement and evaluate measures which aim to make the current practices of pig fattening in Austria more sustainable, especially with regard to animal welfare. This builds on my Masters program in ‘Animal Sciences’, where I focussed on livestock farming. By joining the doctoral school and working on this project I have been given the opportunity to pursue my interests in the field of animal sciences and to contribute to the development of sustainable solutions for current problems in livestock farming. Project: Implementation and evaluation of measures aimed at integrating sustainability aspects into pig fattening. I obtained a Bachelors degree in Animal Production and Rangeland Management from Debub University, Ethiopia, in 2002. Five years later, I was awarded a Masters degree in Animal Production from Haramaya University, Ethiopia. I also have an International Diploma in Dairy Husbandry and Milk Processing, specialising in training and extension, from PTC+, The Netherlands, awarded in 2009. For the last decade I have worked in a variety of research and higher education institutions. I am on the staff of the College of Agriculture and Environmental Sciences, Bahir Dar University, Ethiopia and have been undertaking PhD research since 2012. Project: Human and livestock population dynamics in mixed farming system, North Gonder Administrative Zone Ethiopia. Other participants were: Lemlem Aregu Behailu, Maria Elena Colgiu, Andrea Tony Hermann, Mathias Kirchner, Milena Klimek, Ilja Messner, Hermine Mitter, Kumela Gudeta Nedessa, Kiengkay Ounmany, and Peter Walder. Dr Iris Kunze also participated in the lectures for the course. She is the co-ordinator of the dokNE program and is a postdoctoral fellow undertaking a project entitled: Concepts of human-nature relationship and their applicability in sustainability processes. June 2012 class photograph from the Methods of Knowledge Integration in Inter- and Trans-disciplinary Research course at the Universität für Bodenkultur Wien (University of Natural Resources and Life Sciences Vienna).